The Erie Otters clawed back to earn a key extra point in a 4-3 shootout win over visiting Windsor, inching to within two points of the final playoff spot in the Western Conference. Down 3-1 to start the third period, Brendan Hoffmann (9) and Emmett Sproule (9) scored before the midway mark of the frame to knot the score at three, leading to a nine-round shootout marathon that would ultimately be decided by a Sproule marker. The back-and-forth shootout affair saw goaltenders Daniel Murphy and Colton Incze battle down to the final shot as Murphy stopped Ben Garagan before Sproule put home the winner. Maxim Golod (14) joined Hoffmann and Sproule with regulation markers for Erie while Chad Yetman and Brendan Sellan joined Sproule with shootout conversions. Chris Playfair (6), Jordan Frasca (8) and Connor Corcoran (8) scored Windsor goals before Chase Campbell and Luke Boka scored in the shootout. Murphy earned first star honours with 31 saves before an additional seven in the shootout as the Otters improved to 21-28-2-1 while Windsor fell to 21-28-4-1. The Otters won three of their four games against the Spitfires this season. The Soo Greyhounds had quite a scare, but managed to hang on for a 7-6 win over the visiting Niagara IceDogs. 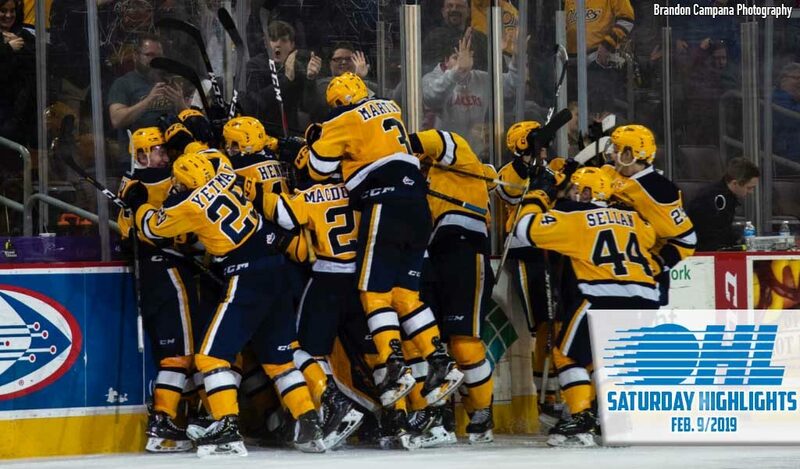 The Hounds led 7-2 before Niagara stormed back with four straight goals in the third period, coming up just short as the Hounds made it to the final buzzer. Keeghan Howdeshell (34, 35) earned first star honours with two goals and an assist while Morgan Frost (33) finished with a goal and three helpers. Sophomore winger Cole MacKay (19, 20) also scored twice for Sault Ste. Marie while Jaromir Pytlik (2), Barrett Hayton (20) and Zack Trott (8) also found the back of the net. Jack Studnicka (22, 23), Jason Robertson (38, 39) and Ben Jones (30, 31) each scored twice for the IceDogs while Kirill Maksimov finished with three assists. The high-scoring affair saw the IceDogs go 2-for-6 on the power play while Sault Ste. Marie was 2-for-8. Niagara took the shot clock by a tally of 45-35. Sault Ste. Marie maintains a two point edge atop the West Division with a 34-12-5-1 record. Niagara suffers a third straight loss, falling to 32-13-7-0 atop the Central. 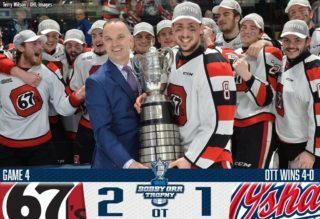 The Ottawa 67’s rebounded from a Friday night shootout loss as Washington Capitals prospect Kody Clark (14) scored the deciding goal in a 4-3 road win over the Hamilton Bulldogs. Cedrick Andree came up with some big saves late, turning aside 26 in total to earn his league-leading 30th win. Lucas Chiodo (25) extended his point streak to 10 games with a goal while Sasha Chmelevski (21) and rookie defenceman Alec Belanger (2) also found the back of the net. 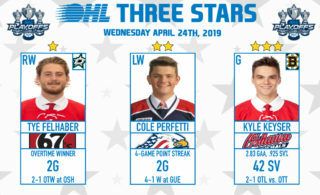 OHL scoring leader Tye Felhaber picked up a pair of assists for the Barber Poles as they won for the 10th time in the past 11 games. Arthur Kaliyev (42) stayed hot for Hamilton with a goal and an assist while Owen Burnell (2) and Matthew Strome (26) also lit the lamp. Ottawa becomes the OHL’s first 40-win team, improving to 40-9-3-2 while Hamilton falls to 24-25-3-2. Dallas Stars prospect Liam Hawel (29, 30) scored twice, reaching the 30-goal mark as the Guelph Storm struck back against the Sarnia Sting, avenging a 6-2 home ice loss on Friday with a 4-1 road victory. Nick Suzuki (27) and Domenico Commisso (7) also scored for the Storm while Keegan Stevenson and Nate Schnarr each had two assists. Rookie forward Jacob Perreault (26) scored the lone goal for the Sting. Guelph improves to 28-14-6-4 for fourth place in the Western Conference while Sarnia falls three points back of fifth place Owen Sound, owning a 23-24-5-2 record. 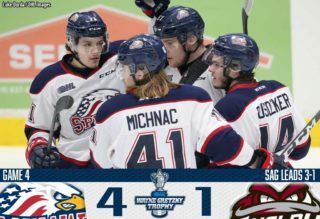 The Saginaw Spirit earned a fourth straight win, outgunning the London Knights on home ice by a score of 6-3 as Owen Tippett (23, 24) and Damien Giroux (21, 22) each scored twice. 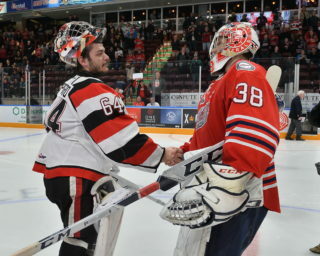 Tippett capped-off the scoring with a penalty shot marker while goaltender Ivan Prosvetov turned aside a season-high 55 shots as the Spirit remained within two points of first place Sault Ste. Marie in the West Division. Tied at two late in the second period, Detroit Red Wings prospect Brady Gilmour (10) scored the eventual game winner as the Spirit won despite being outshot 58-49. Regan O’Grady (7) also scored for Saginaw in the win before a crowd of 5,476. Kevin Hancock (40), Liam Foudy (29) and Alec Regula (8) scored for the Knights while Paul Cotter picked up a pair of helpers and goaltender Jordan Kooy made 43 saves. Saginaw improves to 34-14-2-2 with a 20-5-1-1 record at the Dow Event Center while London sees an eight-game winning streak snapped, falling to 37-8-5-1. The Flint Firebirds managed to hold on for a 4-3 win in Barrie, though the Colts made things interesting with three goals in the third period. The Firebirds climbed out to a 4-0 lead on goals from Jack Wismer (13), Jake Durham (32), Hunter Holmes (8) and Ethan Keppen (24) while Cody Morgan and Evan Vierling each gathered two assists. The Colts charged back in the third though as Jason Willms (12), Ryan Suzuki (18) and Peter Fleming (3) narrowed the deficit to one. Emanuel Vella made 37 saves to preserve the win for Flint as the Firebirds snapped a six-game slide. Ben Hawerchuk and Tyler Tucker each had a pair of assists for Barrie as they outshot Flint 40-31 in the loss. The Colts drop their seventh in the past 10 games, falling to 21-27-2-1, seven points back of eighth place North Bay in the Eastern Conference. Flint earns its 10th win, improving to 10-41-4-0. Los Angeles Kings prospect Aidan Dudas (20) broke up a 4-4 tie, scoring midway through the third period to push the Owen Sound Attack into the lead for good in an eventual 6-4 win over the visiting Kingston Frontenacs. The Fronts rallied back from down 4-2 to tie things up early in the third, but the Attack would recover to skate away with two points as blueliner Brady Lyle (9) earned first star recognition with a goal and two helpers. Barret Kirwin (15), Daylon Groulx (13), Sergey Popov (3) and Maksim Sushko (15) added Owen Sound goals while Andrew MacLean made 30 saves for the win. Nick Wong (8, 9) and Tyler Burnie (4, 5) each scored twice for Kingston while Adrien Beraldo and Ryan Cranford had a pair of assists. The Attack improves to 26-23-2-2, three points up on Sarnia for fifth place in the Western Conference. Kingston drops a 10th straight decision, falling to 12-39-1-1.